Excuse my management consultant side, but thankfully Jamie Oliver put more thought into forming a well-linked relationship when entering the Canadian market. Partnering with King Street Food Co., owners of Toronto’s Buca restaurants, my recent lunch at Jamie’s Italian in Yorkdale was unequivocally better than Edinburgh (consequently, still holds Gastro World’s lowest rating to date). Why you ask? Firstly, we were seated at a table once (a small feat that stumped the hostess in Edinburgh) and our server was friendly and welcoming (albeit needs to trim down the specials spiel to under 1.5 minutes). Already off to a good start. Then when the food isn’t the size of Happy Meals and actually tastes good, my hesitation for returning to the chain subsided. 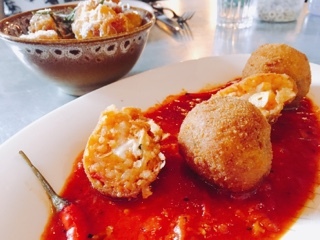 Sure the pre-split arancini ($8.50) was a little strange, but it did remind us that these risotto balls were stuffed with molten mozzarella and to proceed with caution. The crispy rice nuggets were hot and crispy, the creamy risotto inside not overly seasoned so the spicy arrabbiata marinara allowed to shine. Although the polenta chips ($6.95) are marketed as a “side”, they also make for a great starter and nibbling on. 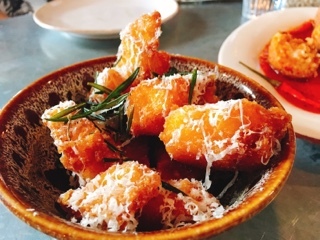 The nuggets of silky polenta arrive with a crackling crust and topped with tons of rosemary and parmigiano reggiano. It’s salty and hot, just one more piece. 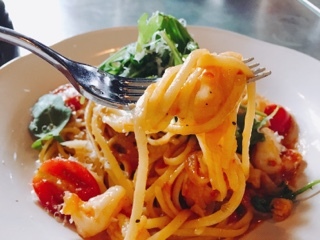 Remembering that Jamie’s pasta was good (just the accompany fingernail sized clams a dismal disappointment), I opted for their famous prawn linguine ($19.95 for main-sized portion). 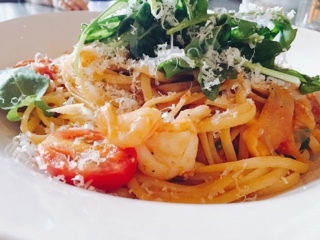 I can see why this is one of their top selling dishes: the fair-sized prawns cooked nicely, the pasta slightly al dante and the garlicky tomato sauce thinned out with fish broth and fennel to keep it from becoming too acidic. Hiding in the background is a bit of spice to give it warmth but not overpower. Jamie’s Italian seats over 200 hundred diners, but can still get fairly busy, so make reservations. It’s a rustic heavenly smelling space, with a charcuterie bar complete with hanging cured meats (we couldn’t tell if they were real or fake), which backs onto a large bar leading into their patio. It’s a large restaurant, yet the various areas keeps it comfortable and cozy. Mr. Oliver, you have started to redeem your reputation after the horrendous Edinburgh dinner. Bold flavours with simple fresh ingredients, that’s what I expected the first time.